THE MINIMAL MID-TOWER CASE The Dark Phantom is the latest in the new gaming PC case series from Antec. The DP501 is a mid-tower case that will house your components in a beautiful yet simple way. It comes with stunning ARGB lighting, a clean, embedded tempered glass side panel and has versatile options for your gaming gear and cooling solutions, supporting ATX, Micro ATX and Mini-ITX motherboards and a built-in PSU cover to protect your components. Build the system of your dreams with the Antec Dark Phantom. INTUITIVE FRONT PANEL FOR STYLE AND PERFORMANCE The DP501 comes with a distinct front panel with a blade-shaped mesh design that truly makes it stand out from other cases, along with a stunning ARGB accent that adds a pop of colour to the minimalistic chassis. The mesh front works to provide improved systematic airflow to heighten your system’s performance and the sleek tempered glass side panel allows you to display your components for everyone to see. 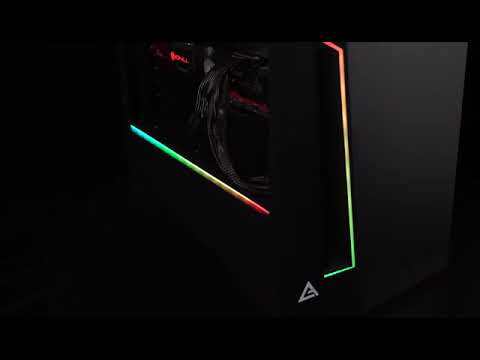 CREATE THE ULTIMATE GAMING RIG The Dark Phantom is equipped to house your components any way you like, with support for all your gear letting you create a system to suit your needs. NEAT INTERIOR FOR HIGH-PERFORMANCE GEAR & UPDATES The space-efficient structure of the Dark Phantom allows you to organize your components with ease, with space for two 3.5" hard drives, four 2.5" SSDs and seven PCI-E expansion slots, along with three additional PCI-E slot covers in the tool box. CONNECT YOUR PERIPHERALS WITH SUPER-FAST USB3.0 PORTS The Dark Phantom comes with easily accessible I/O ports for additional control, with the power button, the LED Mode control button and two USB3 ports for ultra-fast device connectivity lining the top of the case. It also includes a microphone input and a headphone output and a handy reset button. BUILT-IN LIGHTING CONTROLLER Discover true immersion and personalize your ARGB colours with the built-in LED Controller which can connect up to 6 fans simultaneously allowing you to customize to your heart's content. An LED mode button is also located on the I/O port on the top of the chassis for direct access to colour control. COMPATIBILITY WITH RGB SOFTWARES The Dark Phantom has extensive lighting options and is compatible with all the industry-leading RGB software including ASRock PolyChrome Sync, ASUS AURA Sync, Gigabyte RGB Fusion, MSI Mystic Light Sync and can also be controlled via the controller or hub. Connect your motherboard to the module and access 16.8 million unique colours, allowing you to enjoy immersive lighting to accentuate your gameplay to the next level. INCLUDED DUST FILTERS A magnetic dust filter is located on the top of the chassis, along with filters on the bottom of the Dark Phantom, letting you easily keep your build-dust free and optimize your performance. Antec Dark Phantom DP501 Mid Tower, Tempered Glass, ARGB, 120mm Fan, Upto 360mm Radiator, ATX/MicroATX/Mini-ITX is rated 5.0 out of 5 by 1. Rated 5 out of 5 by RoryC from Decent Discrete RGB Mid Tower After eagerly awaiting the release of this (I ordered at the end of January for a Jan 4th release(already in delay)) I received this on about the 9th March. So I was super excited.... I got the product home and unboxed it ready for my build to begin. This was the last item I was waiting for to complete. Upon opening the box, the packaging was complete and undamaged, however there were 2 noticeable damaged plastic items on the case. 1 - The plastic turn screw on the back to fix the side panel on 2 - The foot of the case had a small chip out of the plastic, where you'd rest the side panel into before sliding it in. I did not contact customer services because I'd waited so long for this product, and didn't want to wait again. They also don't affect the function of the item, only the aesthetics. (I'm not reviewing Scan, UPS or Antec on their customer service) The build was super simple, the space for cable management was easy and clean. I would have appreciated some built in clips for some of the longer cables provided by Antec on the case front, but can't be too picky. One note worth looking at, is the capability to accept 160mm PSU power Supplies. I have a 165mm EVGA 650W power supply, and it didn't fit. It's fitted every other mid tower build I've completed. I felt a bit let down by this, It can be squeezed in if clever, but won't come out easily. There is an RGB module in the unit. it's badly placed as a lot of your internal wiring runs past it, and it seems flimsy. It's fully functional, but some of my wiring touches or comes close to it.